I recently joined Influester, a website that allows you to try different products and post reviews about them. They send out these products in what they call a Vox Box. 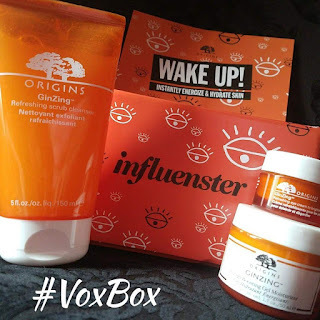 You answer a few questions about different categories, plus they take into account your social reach and other demographics to determine if you are eligible for each Vox Box they send out of products. I signed up a little over a month ago and was eligible to receive my first #VoxBox within about two weeks. It was a Sephora skincare product called Origins- GinZing. Enclosed was a small paper explaining the box and what words to use when posting about it since I received the product for free. They were #Influenster, #ad, #sponsored, and #DiscoverOrigins. This made since to me and it may have helped that I've been a brand ambassador before. There are government rules concerning how to post about products received for free, especially if you are being compensated to try them but a lot of people do not follow these rules. I was grateful that Influenster was very thorough on explaining what to do and how. I couldn't wait to try them. I read a little about the products but not much before trying them because I didn't want to have a biased opinion. Even when receiving free products I will always give my honest opinion. What excited me more than anything about this shipment though was the eye cream. I am getting older so I have darker skin under my eyes most days which drives me crazy. I looked up their retail price and comments on their site after posting my reviews from my pack. I tried the products for a week straight before posting my review. This is one of the first face washes I have used that didn't sting my eyes like crazy just getting close to them and I love it. To be honest I get a little freaked out about getting water in my eyes (Don't judge my fears) so face washes tend to freak me out. Not this stuff. I love using it and never have to worry about it drying my face. Plus I really enjoy the fresh feeling I have after using it. This stuff does what it says I am usually not one for lotions and moisturizers as I hate the way they feel on my hands (again don't judge me..lol). I LOVE putting this stuff on. A little bit goes a long way and I'm not rushing to wash it from my hands after using it which is HUGE for me. The energy boost is nice as well, you really feel it perking you up. It's my coffee before my cup of coffee. Being that my eyes are my problem area I was most excited to try this. While it isn't an immediate fix I can absolutely see a difference after using it for a week and it has allowed me to go without makeup a lot more recently without feeling the need to cover that under eye area. Plus I have serious issues with swelling and this has helped tremedously. _______________________________________________________________________ Well I hope this helps you all looking into these products or looking for some new products to try. I would say they are absolutely worth it! You can also click the link to Influenster above in the post to sign up for your own account, maybe you'll get some awesome goodies too!